We want to try and promote parkour in the local community and dispel negative misconceptions. Our aim is to show older generations in the town that it's not anti-social and can have many health benefits. We’re just hoping that this campaign with Fixers will help lighten the attitudes towards the activity and make it fun for everyone. 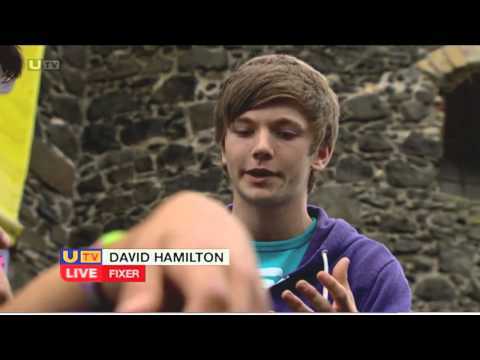 The Mayor supports our Fixers project and appeared in our broadcast story on UTV Live. Cilla has coached some of the gymnasts at the club and supported my Fix by appearing in the broadcast piece. Shaun supported our campaign by printing our branded T-shirts and is involved in discussions about the launch event. Andrew is helping with the launch event. We were invited to The Mayor's Parlour at the town hall in Carrickfergus on 29th October. We met with Mayor Alderman Billy Ashe to discuss the image of parkour in the town of Carrick and what could be done to make it better and more accessible for young people who want to do it. We discussed the possibility of holding a large event in the coming weeks and showed Mr Ashe our T-shirt design, which we created with the help of Fixers. Baring our message, ‘Be Free To Run Free’, we intend to wear the T-shirts at the event. After our story was featured on UTV Live, viewers shared their support for our Fixers campaign on the station's website.